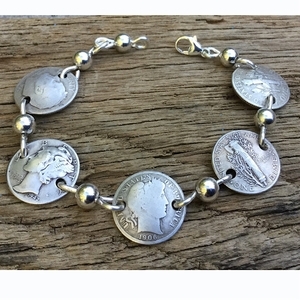 This coin jewelry bracelet has all the eras from the last 100 years of dimes that were silver in America. The center coin the Barber Dime was minted 1892-1916. The Mercury Dime (the two inside coins)was minted 1916-1945. The wings on the head of the dime represent freedom of thought.The Roosevelt dime (the two outside coins) was minted from 1946-1964. The last year silver coins were made in America was 1964.This handcrafted coin jewelry bracelet comes with a card with the detailed history of each coin. This bracelet can be made from your coins for $48. Made in the USA.